Essential Oils book from C.H.I.P.S. Essential Oils offers a cumulative record of information about the technology of essential oils. 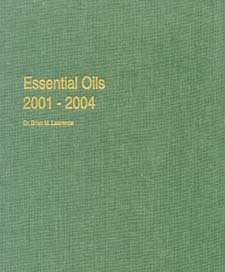 Original review columns written by Brian Lawrence, have been compiled into one necessary reference tool complete with monographs on selected essential oils. This newly added volume brings readers up to date, featuring a diverse range of oils, including lime, thyme, wormwood, Scotch spearmint, dill (oil and extract), anise clove, citronella, and many more.